Three additional antibodies for the detection of different cadherin types have been successfully validated for their utilization in flow cytometry. Specifically, two antibodies specific for the detection of E-Cadherin (Cadherin-1) have been validated in human cell line MCF-7 (ABIN687682 and ABIN1387847) while a K-Cadherin (Cadherin-6) antibody was tested using cell lines MCF-7 and 786-O (ABIN715286). Since we started the initiative we have successfully validated 69 products. The first was a anti-Fibrinogen antibody, followed by a couple of other interesting antibodies and ELISA kits. 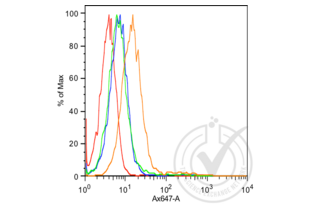 The latest succesfully validated products are the three antibodies for the detection of cadherins (ABIN687682, ABIN1387847 and ABIN715286). A few more products are currentlly being validated.